When the American Phil Mahre's crumpled body finally came to a halt after a horrific fall at the Lake Placid world championships in 1979, few doubted that the damage to his ankle would spell a serious setback to a career which, until then, had been rich with promise. Almost unbelievably, Mahre made it to the Winter Games in the same city just 12 months later and entered all three Alpine skiing events, despite still having the contents of a small hardware shop screwed into various nooks and crannies of his ankle. He was completely out of touch in the downhill, where he finished 14th, and the giant slalom, where he could only manage 10th. But in the slalom Mahre's wonderfully defiant first run, when he drove the great Ingemar Stenmark into second place, caused a flutter of anticipation among the spectators, conscious that they might be about to witness a great victory. But the American could not quite produce enough magic to beat the Swede and in the end he had to be content with a brave second place. 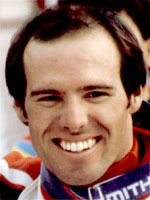 Mahre, whose twin brother Steve was also a first-rate skier, had gradually built up a formidable reputation on the circuit since his first races in 1976, when he won the slalom at Val d'Isere. The American went from strength to strength despite that setback, reeling in the overall World Cup title in 1981, 1982 and 1983 as he geared himself up for his next assault on the Olympics, due to be held in Sarajevo in 1984. All eyes were on Phil and his twin brother Steve in the slalom, with spectators and millions watching on television eager to see if the Mahres, who had given up taking part in European competitions, could deal with the Sarajevo snow. Phil had to be content with third place in the first run, with Steve taking first spot. But in the second run Steve made an error at the top of the course and Phil, swooping on the opportunity, raced in for his handsomely-deserved gold medal, while Steve took the silver. After their superb Balkan one-two, the Mahre brothers retired from competiton in 1984, the victory count for Phil on 27 while Steve had chalked up nine wins. The two brothers opened a training centre together in 1985 at the Keystone resort in Colorado.